How to Style Western Wear Trends Fall 2018 | Fashionomics "every page"
Happy Friday!!! I love to travel but why is it so hard to catch up the next week?? I have to pinch myself when I walk outside this week because it is actually cool. We have had some of those clear sunny crisp days of fall. I was planning to go to The State Fair next week but rain is predicted!! If you don’t live in Texas you may not know that we think that our State Fair is something special!!! Now on to Western Wear Trends Fall 2018. If you live in Texas maybe western wear trends are always in style. Of course the runways have put a glitzy spin on the traditional looks like my fun black and white buffalo plaid shirt from Alice & Olivia. 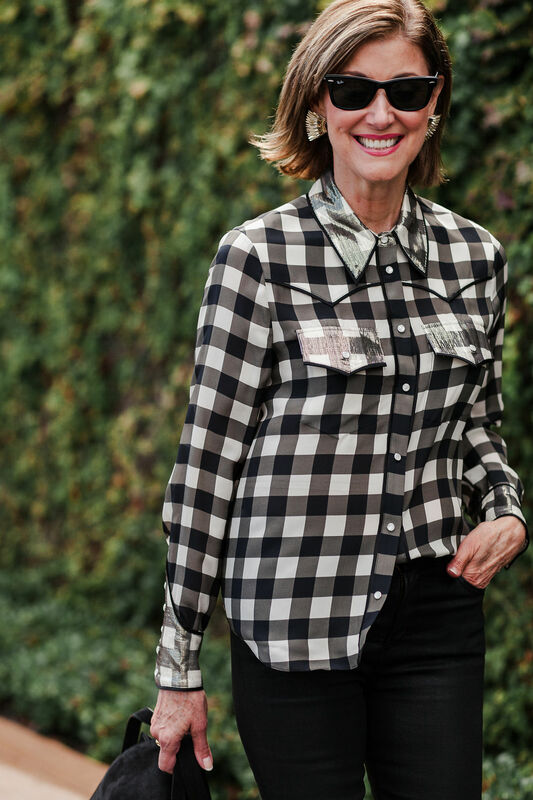 Here in Texas we may take western wear for granted but this trend has been all over the runways for several seasons and maybe it really never goes out of style. Veronica Beard based her collection this fall on the 1980’s TV series Dallas!! Well I was modeling in NYC at that time and wondered why anyone would watch a show about Dallas?? I also bought my first pair of cowboy boots on Orchard Street. Kind of weird for a girl who grew up going to my grandparent’s farm in west Texas for summer vacay and holidays!! I love wearing cowboy boots and never get tired of my turquoise jewelry. I hope you can see that this blouse has an iridescent collar, pocket flaps and cuffs along with the traditional western style. There are so many ways to add a bit of western flair to your wardrobe without going overboard. I’m obsessed with these earrings from Mignonne Gavigan and you can find them at Tootsie’s or Neiman Marcus. Turquoise is such a beautiful and flattering color that I think it is aways in style. If you don’t own a pair or cowboy boots now is your chance. They are everywhere from Neiman Marcus, Nordstrom to Net-A-Porter. There are so many styles that you can wear a traditional western boot or a stylized high heel fashion metallic western boot. These boots can be simple or outrageous; reasonably priced or really expensive. I have tried to show you a wide range of styles and prices. I was shopping at Tootsie’s again and fell in love with this shirt. I did not have my cowboy boots and really wish I had to make a point. There are so many options for you to embrace the western wear trend a little or a lot. You have heard me say before that Fashion is Meant to Be Fun!! So have some fun this fall by adding a few western touches to your wardrobe. 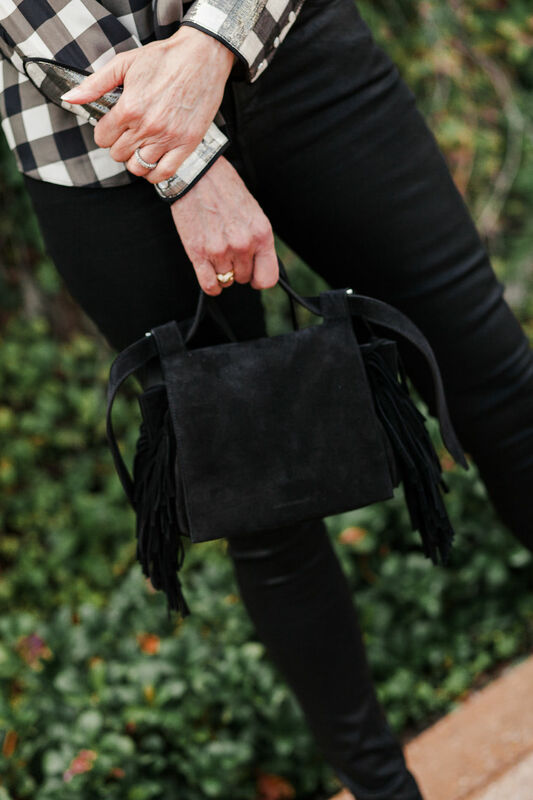 I found quite a few really great bags in suede with fringe detailing. This is an easy accessory to add to your collection.